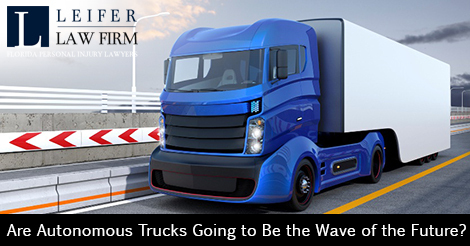 Are Autonomous Trucks Going to Be the Wave of the Future? Google and their self-driving cars have received plenty of attention in the news and internet media. In fact, they’ve held the primary spotlight for driverless technology. Autonomous trucks, however, may be the next development to help address the impacts of human error. Those people injured in a Florida trucking accident may have devastating injuries requiring the insight of a lawyer. Why Are Driverless Trucks Emerging as a Trend? The primary reason behind support for driverless trucks, however, doesn’t have as much to do with safety as you might typically expect. In fact, the biggest reason that the trucking industry is considering supporting and investigating driverless technology is because there is a major shortage of willing truck drivers in the US as many baby boomers hit retirement age and choose to discontinue truck driving in general. Even though lack of truck drivers is a serious problem for the industry, consumer demand is expected to stay at least the same if not grow over the coming years. That means an equal number or more of trucks need to be on the roads, all with deadlines to meet. Given that prioritizing deadlines already involves a challenge for truck drivers bound by federal regulations about the amount of rest they must receive, autonomous trucks may be the only way to confront high demand. Are Autonomous Trucks Really Coming to Florida and Elsewhere? This kind of technology will not be present on America’s roadways for many years to come. Technological advances that are helping to make truck driving safer and the roadways in general much safer. New technology advances called the advanced driver assistant system help drivers with convenience tools like automated gear changing, power steering and cruise control. While passenger vehicles have had these for some time and therefore, might take these advances for granted, they are critical for the initial stages of potential truck vehicle autonomy. Anti-lock braking systems and tracking control go one step beyond convenience and can be critical for truck drivers. This can make it easier for truck drivers to adapt and handle challenging road conditions. Likewise, electronic stability control enhances vehicle stability by monitoring road conditions and adjusting and handling of the vehicle in order to prevent roll overs and skidding. When these tools work together in a combined system they can help to prevent devastating accidents and help a driver compensate for skill related issues or weather related problems. Detecting objects in the truck’s path can also alert the driver and give him or her a better chance of adapting quickly. Unfortunately, far too many individuals have sustained critical injuries after being involved in a trucking accident. Although autonomous trucks and cars are still in the development stages, many helping to create them believe they will have a big impact for reducing car crashes throughout the U.S. Since car crashes are a leading source of injuries and deaths all over the country, the government is looking for all opportunities to protect victims from injuries and deaths. Autonomous vehicles may be essential for cutting down on this disturbing trend. Technology in the form of a distraction can be deadly, but it might also be used to cut down on accidents, too. Despite the fact that trucking regulation have tightened up in the last several decades, there is still plenty of room for growth as many individuals suffer injuries and consider filing personal injury lawsuits. You should never attempt to handle a personal injury claim on your own. Remember that the trucking company likely has experience in handing over these kinds of claims to knowledgeable attorneys and that those attorneys will be working hard to make the case that the driver is not responsible. If you believe you may have grounds for a trucking accident lawsuit, it is in your best interest to collect any evidence from the scene of the accident and to present it to an experienced Florida trucking accident attorney. This may be the only way to protect yourself going forward with a legal claim.